LADIES, I HAVE NO IDEA WHY you spend so much time and money shopping for clothes and making yourselves up. 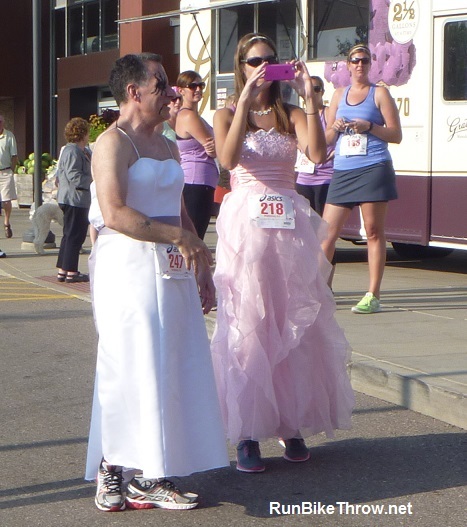 I can put together an outfit in just a few minutes, with clothes I already own, then run a 5K in them – and win a Best Dressed award! “GO! GO!” Randy called. I looked myself over one last time. Tuxedo jacket in place. Bow tie straight. Carnation presented just so. Perrier water bottle strapped to my belt. Good to go! 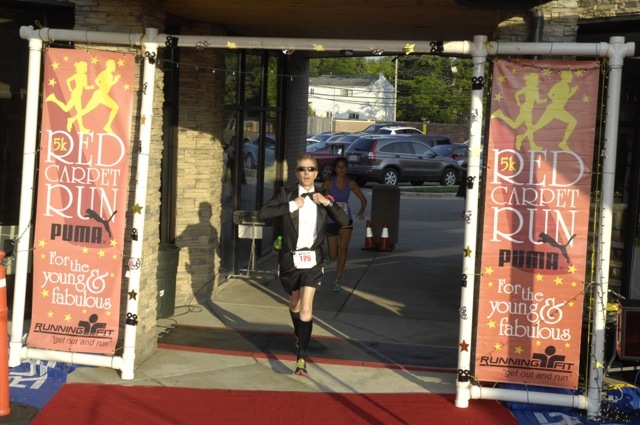 And I and three hundred of the best-dressed runners you’ll ever see jogged elegantly down the red carpet, over the starting line, and into West Bloomfield for an eye-popping 5K. Lots more where this came from! See below, if you dare. I’ve run a lot of races this year. 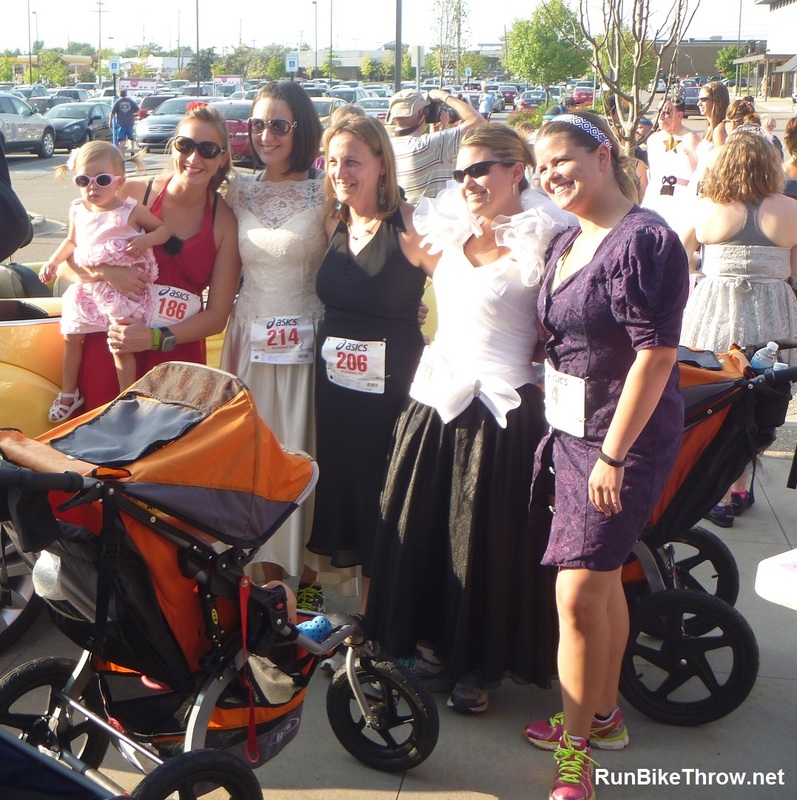 Some, like the Super 5K, were about pure speed. Some, like the Dances with Dirt ultramarathons, are about endurance. 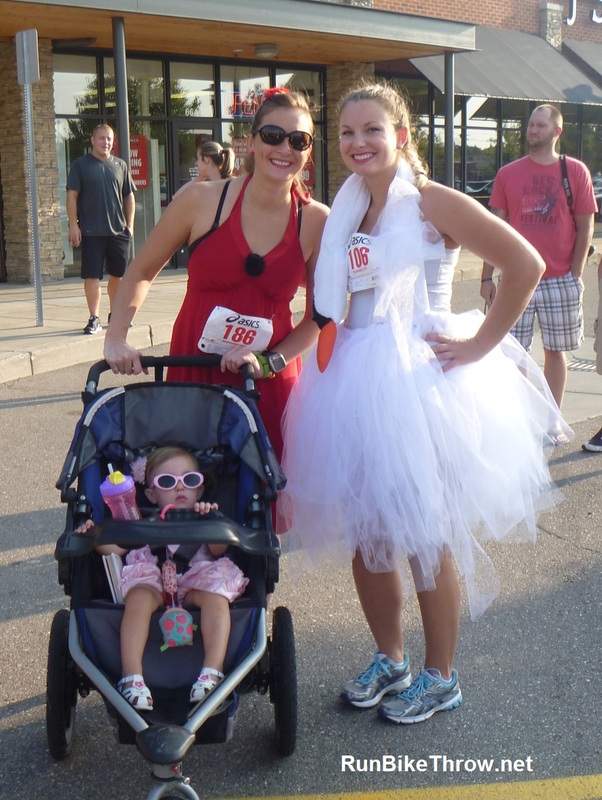 Wednesday’s Red Carpet Run was all about the look. Poking around in the dark neglected corner where my suits are, I came across my old tuxedo – from high school no less – but in good condition and reasonably dust-free. And the jacket still fit (more or less)! A white button-down collar shirt and black bow tie took care of above the waist. Below I wore shorts and my newest running shoes, although I bowed to fashion and put on over-the-calf dress socks. Then just a couple of accoutrements to pull the look together. I bought a bouquet and took a carnation from it for a boutonnière. (The rest went to my lovely wife, naturally.) I steamed the label off a bottle of Perrier and put it on a smaller green plastic bottle, then attached it to my SpiBelt with electrical tape. 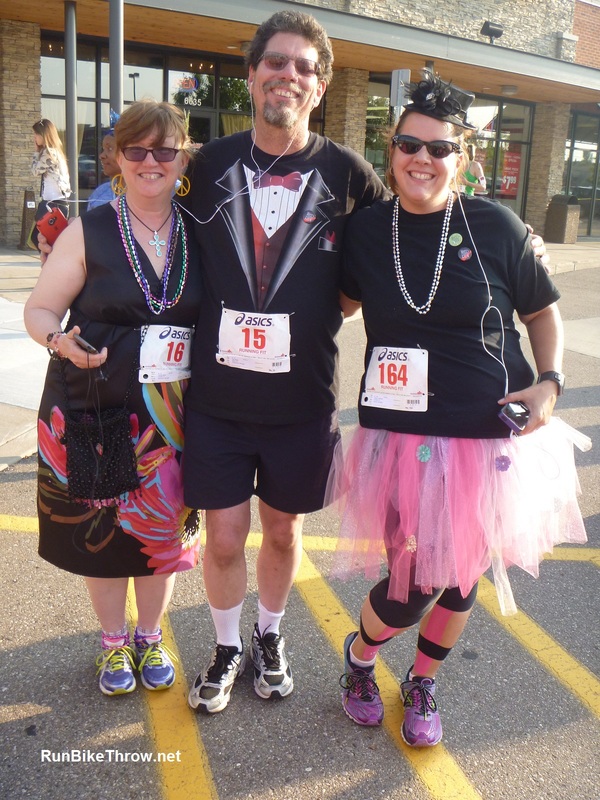 Put on the shades and my Garmin, and the outfit was complete! So did everyone have to go to the lengths I did? Well, no. Actually, the RCR dress code, if you can call it that, is very fast and loose. Just about anything goes – and just about anything went. I will let some photos here tell the tale. I hope that’s not the next Paris Hilton in the jogger. If this one unsettles you, perhaps you should move on right now to the next blog on your list. I warned you! Actually, I told him he was either a very brave man, or someone in need of some additional surgery. 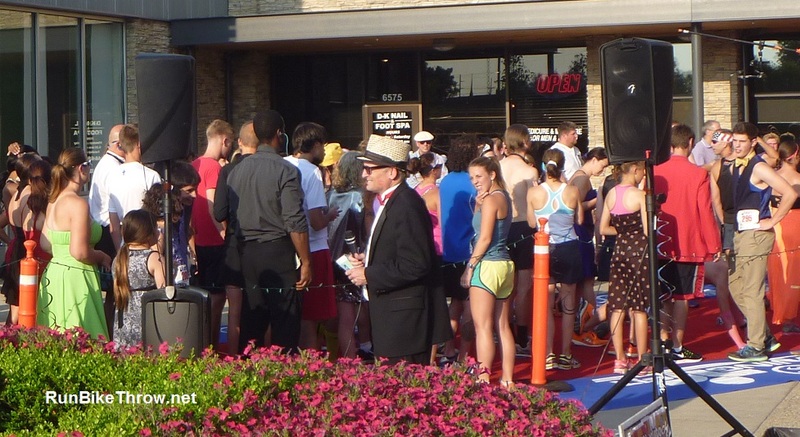 The run itself (yes, I really did run a 5K in a tux) was mainly through a residential neighborhood. We got some spectators in lawn chairs cheering us on, and I’m sure we got quite a few stares from the rush hour traffic on Maple Road. Would have been fun to have some paparazzi around, though. And as for my time? Do you recall me saying it was all about the look? I’d like to see George Clooney look this good after a 5K. Even the post-race spread was stylish. Fresh grapes and berries, fancy crackers and cheese (including Brie, bien sûr), and even flutes of champagne. Not a bagel or banana to be found! And then came the award presentations. 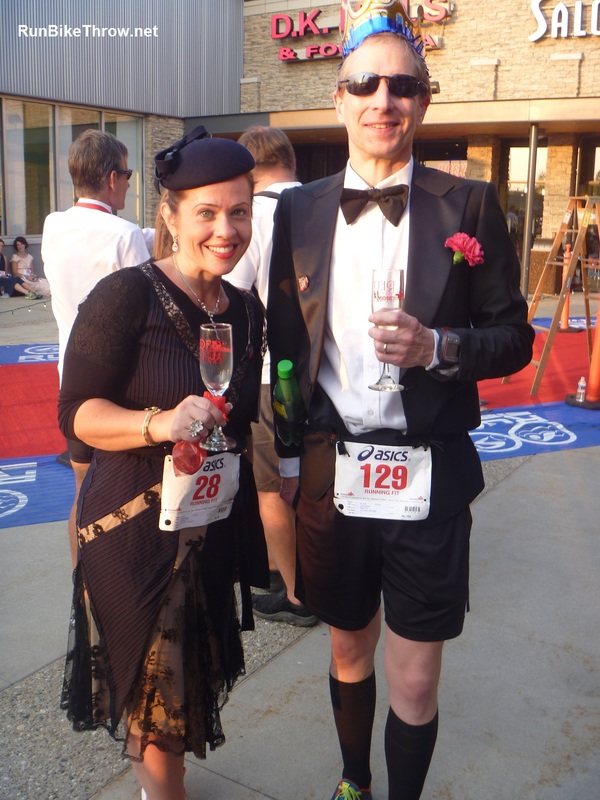 In addition to recognizing the top finishers, there were awards for the best dressed man and woman. The judge was Doug Kurtis, winner of many marathons and the world record holder for most marathons under 2:20. He approached me as I was walking around after the race. “Stick around,” he said. “I think you’re going to win.” And I did! Me with the Best Dressed woman. Black was definitely the name of the game tonight! So an outfit I put together in 15 minutes with a couple of cheap gags won me some nice extra swag, and even an interview from Michigan Runner. See, that’s all it takes! I have to go now. My wife is throwing things at me. I had no idea she was so envious of my fashion sense. Next up: my final triathlon next Wednesday. Back to focusing on performance – no style points there. 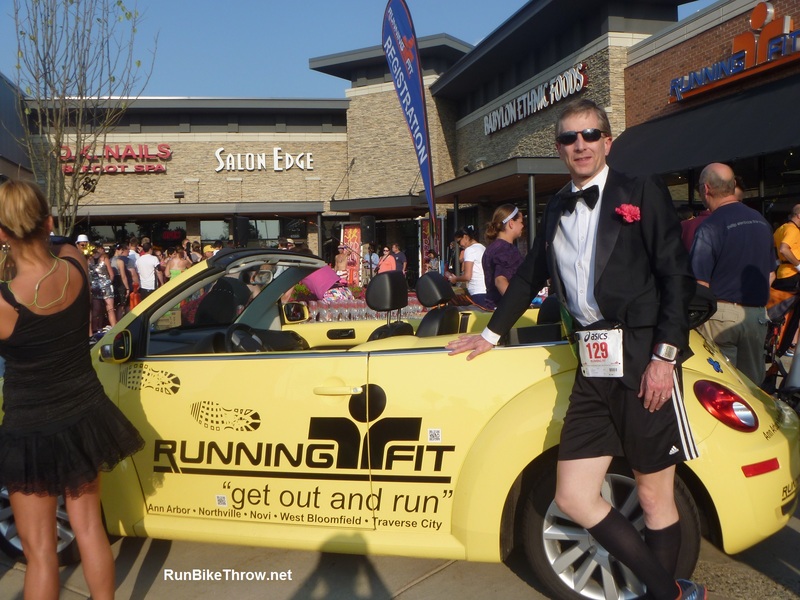 This entry was posted in Running & Cycling and tagged 50, Best Dressed, fitness, Red Carpet Run, Running, Running Fit, style, tuxedo. Bookmark the permalink.